Phosphorescent Pigments Market Size was valued over USD 200 million in 2016 and the industry will grow by a CAGR of around 4.5% up to 2024. Phosphorescent pigments market will see exponential growth in the coming years owing to its increasing applications in various signage boards and consumer goods. The substance, better known as “glow in the dark” pigments is usually made of fine of zinc sulfide crystals doped with copper. This glow is a result of the unique properties exhibited by crystalline zinc sulfide. Copper activates the crystals to absorb light and gradually emit it with time to generate a dull phosphorescent sheen. Japan based Nemoto & Company later initiated the production of phosphorescent pigments with alkaline earth metals such as strontium under the brand name of LumiNova, which has higher brightness and durability than the conventional zinc sulfide based products. Increasing usage of the product in various signage boards for emergency exits and low-level lighting escape systems as a result of mandatory building and construction guidelines will drive the phosphorescent pigments market in the coming days. The product has serious applications in safety sign boards such as fire exits, escapes, etc. which must be visible in murky and dark environments. Phosphorescent pigments market is also driven by its use in all types of paint and powder coatings. The powder is added to paints & coatings where the light absorption & releasing process of the products can be repeated continuously. The crystals absorb the light in an illuminated environment and glow in the darkness by emitting the absorbed light. These glow in the dark water based paints are of superior quality and allow the user to create astonishing works in an exceptionally new medium. Moreover, this unique photo-luminescent pigments are also incorporated into many resins and coatings. Plastics find major applications of phosphorescent pigments market as these are employed in the formulation of plastic sheets & films. The product enhances the glowing properties of the plastics in the absence of light. Lack of radioactive components, long emission time, high durability, outdoor usage, and excellent temperature resistance of the particles ensure appearance of optimum luminous effect in plastic sheets. Major applications of phosphorescent pigments in plastics include automotive interiors, novelty toys, military equipment, wheel coatings, emergency signboards, and packaging. Raw materials used in the product manufacturing includes copper activated zinc sulfide powder and strontium aluminate powder. Zinc sulfide is vastly used in the manufacturing of semiconductor materials. Hence, the price of zinc sulfide is affected by the zinc demand and its ores. The prices of strontium aluminate are higher than its substitutes and hence can hamper the phosphorescent pigments industry during the next several years. The phosphorescent pigments market is segmented on the basis of product as zinc sulfide and strontium aluminate. Zinc sulfide activated with copper or silver was initially the most commonly used phosphorescent pigment. It has largely been replaced by strontium aluminate activated with a rare earth metal as it has luminance which is approximately 10 times greater than zinc sulfide. The strontium aluminate segment is said to grow at a CAGR higher than zinc sulfide due to its superior qualities and competitive pricing. Increasing application of strontium aluminate in various end-user industries, and replacement of zinc sulfide with strontium aluminate will propel the segment in the coming seven years. Paints & coatings, printing inks, plastics, and construction materials are the major end-user industry segments for the phosphorescent pigments market. Some of the minor end-user sectors include textiles, rubber, digital electronics, etc. and have been considered in the others segment. Rising use of the product in processing of inks required for offset printing, screen printing, and flexographic printing will further foster the industry in the coming years. Printing inks segment accounted for over a fifth of the global market in 2016 and will witness substantial growth in coming years. The paints & coatings industry has been one of the key end-users of phosphorescent pigments valuing to over USD 65 million in 2016. Growing demand for photo-luminescent paints is expected to drive the phosphorescent pigments market during the forecast period owing to their extensive consumption for manufacturing glow in the dark paints that are applied on escape pathways in aircrafts, and also in interior decoration in residential and commercial constructions. 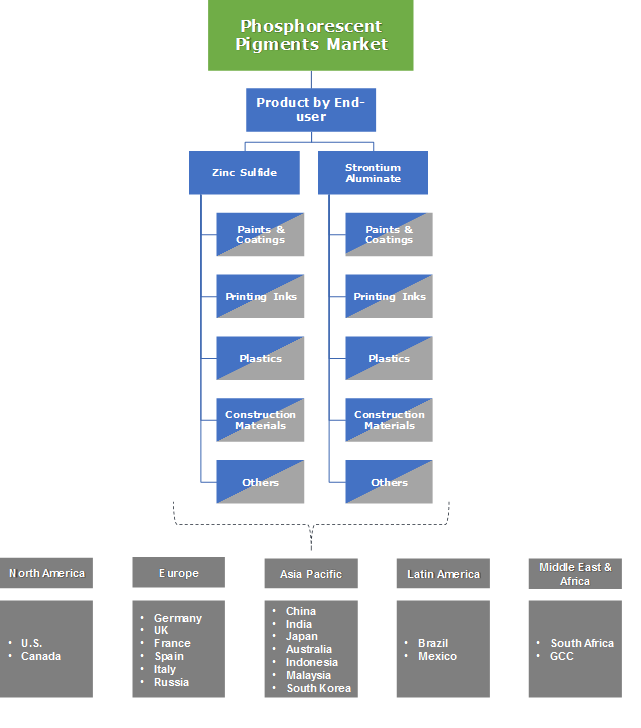 Considering geography, Asia Pacific holds a major share of close to 50% in the global phosphorescent pigments market. Notable growth in the regional paints & coatings industry coupled with the increase in the construction activities will drive the phosphorescent pigments industry demand in the region in the upcoming years. The regional market is led by China, which generated a revenue of over USD 40 million in 2016 and will witness high growth driven by the developing plastics and electronics industries. North America and Europe together accounted for close to 40% share in the global phosphorescent pigments market. Mature end-user industries in Europe and shift towards the East will result in a sluggish growth rate in the phosphorescent pigments industry in the European countries. North America, on the other hand, will witness growth at a CAGR around 4.5% owing to the large number of commercial buildings in the U.S.. Latin America will witness growth with a CAGR close to 5% from 2017 to 2024. Prominent global companies which show significant presence in the phosphorescent pigments market are Nemoto Lumi-Materials, Glotech International, Honeywell International, and LuminoChem Ltd. These major players consist of a significant share in the global phosphorescent pigments industry. Nemoto Lumi-Materials is the global market leader based in Japan and has its production capacities in subsidiaries as well as joint ventures in China, Portugal and Switzerland. Other notable companies in the phosphorescent pigments market are Radiant Color, United Mineral and Chemical Corp., Next Generation, Tavco Chemicals, GloNation, GTA, RTP Company, RC Tritec, Glow Inc., Lightleader, and Allureglow International to name a few. 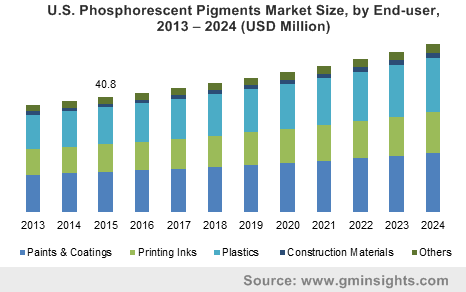 Phosphorescent pigments market will witness significant growth in the coming years owing to the rising demand for photo-luminescent paints & coatings. The product is available in different particle sizes from 1 – 2 mm down to 2 microns. Rising construction activities leads to the increase in construction materials demand which will further propel the product market demand. Introduction of new reflective and glowing signage boards will further create a positive influence on the product demand. The industry ecosystem analysis shows a significant amount of forward integration among the market players as companies manufacturing the pigments often supply inks, coatings, and tapes with glow in the dark effect with these pigments. Limited variety of product due to the rare photo-luminescent properties will also have a significant influence on the industry as manufacturers continue various R&D activities to develop new products and gain better position.